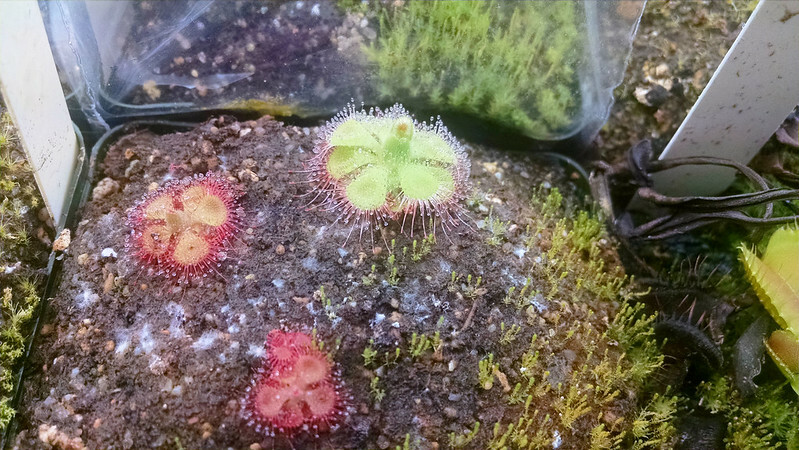 Assorted plant stuff |Sundews Etc. One can't always have a nice themed post. This is one of those times. My Pinguicula laueana × emarginata is blooming again. 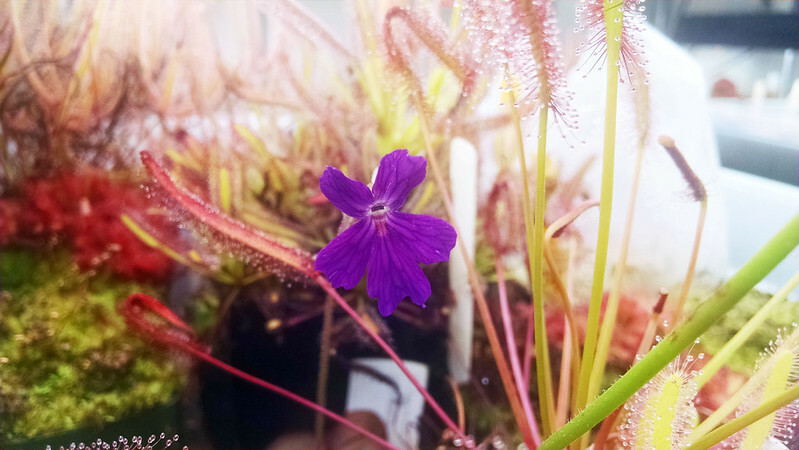 Lovely flower of P. laueana × emarginata. This has got a really pretty flower. It's interesting, I've only ever flowered this plant, my Pinguicula gigantea, and my Pinguicula emarginata. I don't know what triggers flowering in pings. I've got several that I think are big enough to flower, but they just haven't. In pygmy news, there are finally gemmae forming on my Drosera scorpioides. D. scorpioides gemmae is quite the hot item. I think I'm going to need to start a new pot of these guys or risk losing these to attrition. Should get a good crop though, last year I had a lot. The Drosera barbigera look funny and squashed with their gemmae. Such nice color this time of year too. 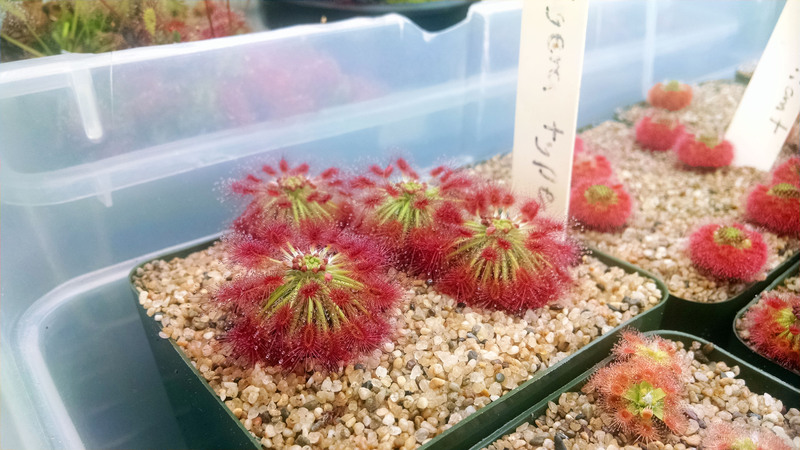 Drosera burmannii (Gunung Keledang) is growing in, and isn't quite as red as it was before. 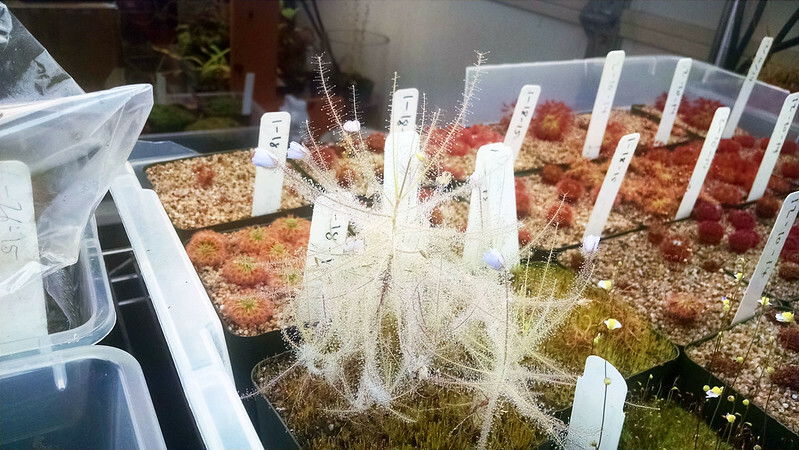 One can never have enough Drosera burmannii. I quite like this form, especially if it maintains that green leaf, red tentacle coloration. It's taken well to feeding. My Byblis liniflora continues to be lovely, and continues to be impossible to photograph. This plant is very dream-like. I feel like this would need to be in a black box with bright diffused light to photograph well. Has anyone out there managed to get a good picture of B. liniflora? I'd love tips. 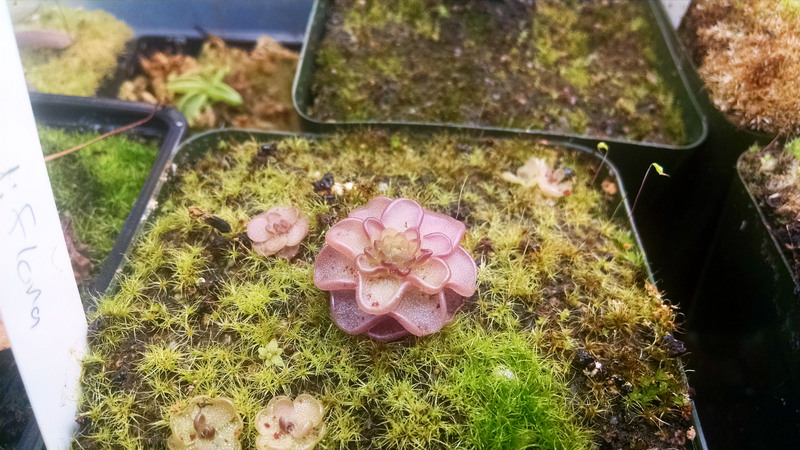 Finally, I haven't posted about Pinguicula rotundiflora lately, but it is way too cute. Look at those cute little leaf margins! Now this is a plant that I want to flower. Luckily this one is pretty easy to propagate, as evidenced by all the babies in the pot. Maybe I can have a whole bunch in flower together. That would be adorable. So I guess that's what's up around here. Woah! Cool! :--) What are your conditions for pygmy 'dews since they look so thriving and colourful? I grow them under T8 fluorescent lights in my garage. It stays pretty cool in my garage, and they get lots and lots of light. There are six 4-foot bulbs per growshelf, and the lights are around 8 inches from the plants. The soil mix is essentially just peat and sand, nothing special, but I use a 1 cm topdressing of pure sand to keep the moss down. 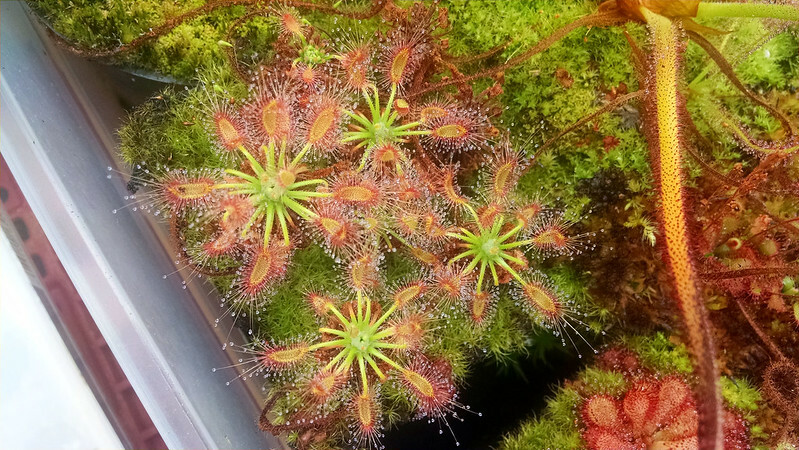 I water on the tray method like all the rest of my Drosera.